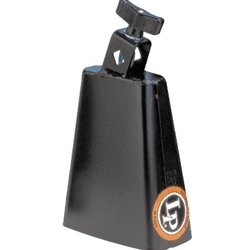 Latin Percussion LP204A - The most recorded cowbell of all time! Handmade. Features forged eyebolt clamp assembly with oversized wing nut to provide secure placement on 3/8"-diameter mounting rod with only finger tightening. A slightly rounded playing surface makes it easy to get a good sound with every hit of the stick.